I have been using Carnation® Evaporated Milk a lot lately. I used it in this delicious butternut squash soup recipe. I also use it in my everyday dishes, like homemade mac and cheese, lasagna recipes and more. I like how easy and simple it is to use. The Carnation® Evaporated Milk website has tons of recipes, from appetizers to desserts, so I never run out of ideas. Carnation® Evaporated Milk has been helping Canadians bake delicious recipes, like pumpkin pie and fudge, for years. Make sure to check out their website and get inspired by their ideas. 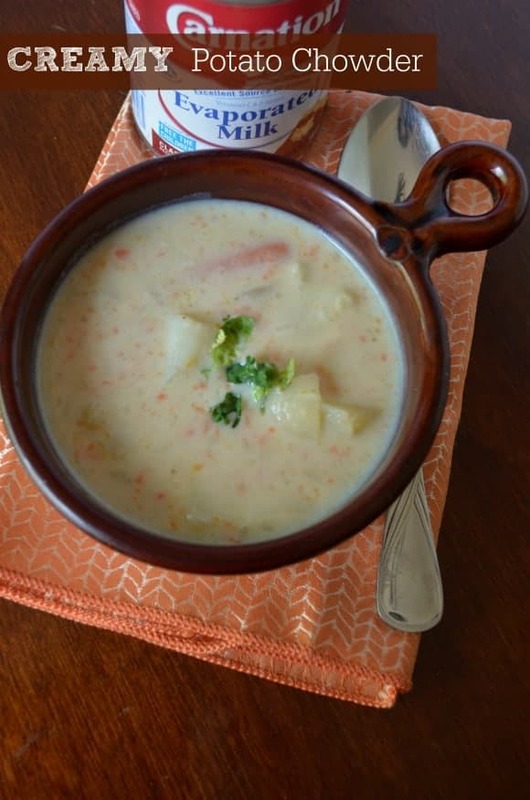 Let me share with you this delicious potato chowder with Carnation® Evaporated Milk. It was so creamy, rich and good that I had to make a second batch the following day. I tried with Carnation® Regular, 2% and Fat Free Evaporated Milk. I find they have the same creaminess. It’s a win-win: less fat for the same creaminess and texture. Visit the Carnation® Evaporated Milk Website to find even more creamy, delicious recipes! Although this post has been generously sponsored by Smucker Foods of Canada Corp. and they sent me free product samples, the opinions and language are all my own, and in no way do they reflect Smucker Foods of Canada Corp. Potato soup is my all-time favorite, but I don’t think I’ve ever had it as a chowder. May have to try it! YUM. It is so easy to make too. I have to try it. I love my husband’s potato soup but I’ve never made it myself before. I have never used Carnation before because I didn’t know what to do with evaporated milk. Thanks for all the ideas! I love potato chowder. What a great way to warm up on a cold day. That looks amazing! I love potato soup, I wish I could reach through my laptop and grab a bowl. Pinning! I am a sucker for soup during the winter! Usually “creamy” and “healthy” don’t seem to mix, so this is a double win! It’s 16 degrees here. This is just what the doctor ordered. This looks so tasty. Ive cooked with Carnation milk and it really helps make a meal more creamy. Love that. This sounds yummy! We have had flurries here on my side of Michigan. The other side of the state is already covered in snow. Our turn is coming and soup weather will be here in full force. This sounds like an awesome chowder. I love anything that has potatoes in it. This is going to hit the spot on cold day. Tis the season for soups This looks yummy. Potato soup on the menu! This looks so delicious. I have not tried to make a potato soup yet. This looks like a great recipe for me to try for my first attempt. I haven’t had a good potato chowder in a while. I should give this recipe a try. Looks like a delicious dish for a colder weather! Thanks for sharing the recipe and tutorial too! I love potato soup and it is something that I make often. This looks delicious so I pinned it so I could try it like this. 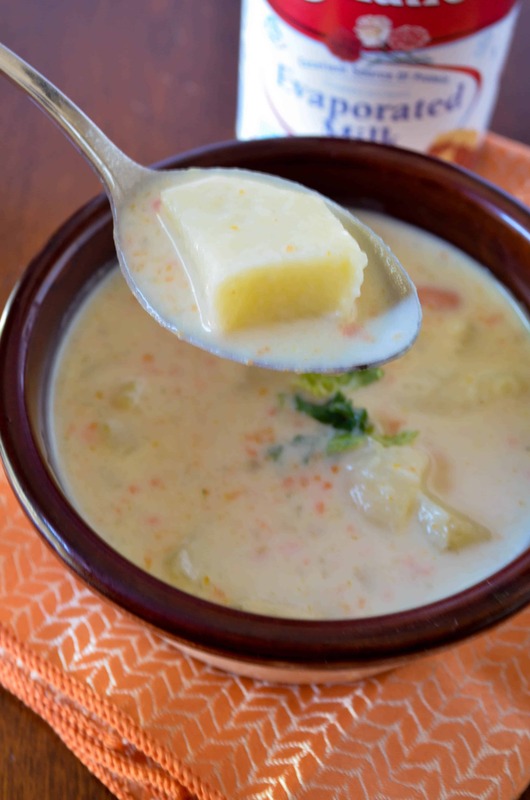 Creamy potato chowder sounds like it’d hit the spot for me! Great for the winter time! This is one of my mom’s favorite soup. She doesn’t cook anymore so the next time we are together, I am going to make this recipe. I know she will love it. That sounds and looks like a great recipe. I will be giving it a try this winter. It’s been a while since I’ve had a great chowder. This looks delicious. That looks like a total comfort food, very yummy. I love using carnation evaporated milk in my soups! Make is so much more creamier! I have to try this easy recipe! That sounds super delicious. I love carnation evaporated milk. It’s something that I actually grew up with. My mom would make hot chocolate with it and it was oh so good. This looks and sounds really great! It’s getting cold here in Canada so I’m all about the soups lately! Should give this a try! I am so cold, I wish I had a big bowl of this right now to warm me up! It looks delicious! IT is just one of my favorite soups! I would love to try your spin on it! I’m not sure I’ve used that in soup before, but that sounds like a great idea. The potato chowder looks fabulous! I love potatoes soup. I’m going to make the recipe for sure. I love potato chowder! It’s always so satisfying when it’s cold outside. This is close to how I make my potato soup. It is one of my favorite meals during the cold winter months!!! What is the difference between chowder and soup? It looks amazing and delicious. Yummy! I LOVE potato soup, so I’ll have to try this chowder! Thank you for sharing! That sounds delicious. I have never had anything like this before. Yum! This Amazing App Helps You Organize Group Activities the FUN Way!